Love is in the air – and mail for our three Valentine’s Day Poll winners: Congratulations Kate Thompson, Jenni Bryant and Jessica Arnavas. Our Valentine’s Day Poll held throughout February has now concluded. 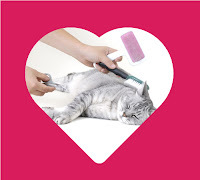 VetShopAustralia would like to thank all participants; as our poll results have revealed many interesting statistics about the love between pet and pet owner. Valentine’s Day has led to more than just partners sharing three special words; 81% of respondents surveyed admit they regularly say “I love you” to their pets. Romance is also in abundant this month with 77% of pet owners giving their pets a kiss as a gesture of love. The majority of respondents, 92%, agree that buying treats shows their pets love on Valentine’s Day. Of course, the ultimate way to show pets love is to care for their health and wellbeing; as is made evident by the 82% of respondents who maintain their bond by walking their pets. Another 72% of respondents like to pamper their pet, giving them a bath and a brush. The results of the poll prove there are numerous ways we show our pets love and they definitely play a huge role in our Valentine’s celebrations. Win Bling with Kiltix Congratulations!